First published in 1988. Fredrick Tomlin and T. S. Eliot were friends for almost thirty-four years. What emerges from Fredrick Tomlin’s memories and the many letters which passed between them is a private Eliot, seen only by his closest family and a trusted few. Tomlin evokes the man as he was – quite different in his humanity and in his humour from the public image of the ‘great poet’ and the austere sage. 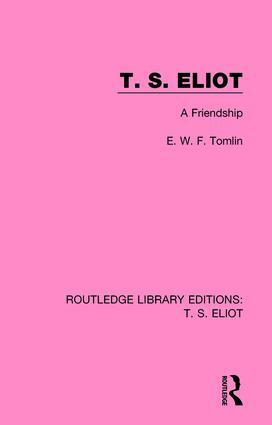 With fresh insights and personal testimony, Tomlin directs light onto aspects of Eliot’s character and personality of which the public has been unaware, thereby enhancing the reader’s appreciation of Eliot’s work as a whole. This title will be of interest to students of literature.